We are proud to offer these high quality performance slotted and dimpled/slotted rotors. 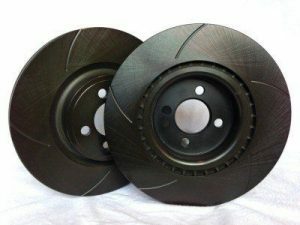 These rotors are custom machined here in the US from grade G10 SAE J431 Gray Iron and zinc coated black to prevent rust from tarnishing the appearance of your ride. The extra machining allows water and brake pad gassing to escape under heavy braking, assists in cooling the rotors and increases braking performance by up to 30% over factory rotors. The G10 material provides significantly better thermal characteristics over steel and also provides greater dimensional stability at elevated temperatures. Each rotor also carries a Lifetime Warranty against cracking and warping. Please note that we do not offer drilled rotors. Regardless of make, drilled rotors have a tendency to develop stress fractures around the holes when put to hard use. Our customers safety is our first priority and dimpling creates the appearance of drilled rotors without the loss of structural integrity.